The Testudo genus of tortoises are found in many places such as Western Asia, Europe, and North Africa, and are small tortoises that range from 7.0 to 35 cm in their length, and 0.7 to 7.0 in their weight size. The tortoises are known as grazers, and they enjoy a larger variety of flowers, leaves, and different types of plants to be included in their diet. 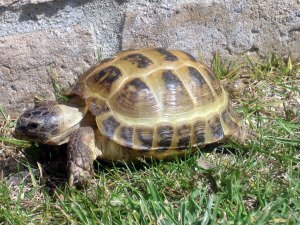 The Horsefield tortoise, also named the Russian tortoise, is known as a small tortoise, that ranges in size from 15 to 25 cm. The females can grow slightly larger than the males, and the male Horsefield tortoise, has a slightly longer tail that stays tucked to the side. The Horsefield and Russian tortoises have four toes and can live as long as 75 years. This species of tortoise are sociable with humans, and they make wonderful pets to people that care for them. The tortoises are herbivores, and should be fed grasses, vegetation, flowers, and all leafy green vegetation and flowers of plants and weeds that are not poisonous. The tortoises does require a well-balanced diet to keep them healthy, and many people can give them food pellets on occasion. There are also some foods to avoid given the Horsefield/Russian Tortoise, and these foods are, lettuce, tomatoes, spinach, bananas, and cucumbers. Foods high in calcium are very important to give them for their shells to remain healthy, but it is also important not overfeed them. The tortoises do require fresh water for drinking at all times. The Horsefield/Egyptian tortoises are readily available tortoises that are not known to be endangered tortoises, like other species. The Russian tortoise are usually always imported into the United States as young adults between 4 and 5 inches. The tortoises are large enough to handle sub-prime conditions during times of shipping, but they are small enough to fit into a fixed sized crate. Russian tortoises that are larger in size and over 6 inches long, can be difficult to find in pet stores, but can often be purchased from other people that have them. With the proper care, these tortoises can live for a half of a century. Hermann tortoises are known as one of the more popular types of tortoise to have as a pet. This tortoise is known to sometimes form a bond with their owner, which makes it easier to know what they like or dislike. The Hermann’s Tortoise lives around 75 years, and are very native to the Mediterranean Sea. The Hermann tortoise is identified through their tail, which includes a nail, or a large scale on the end. The tortoises are bright in color, which often fades as they age, and the male Hermann tortoises are usually smaller than the females. The two races of Hermann tortoises that exist are, the Eastern race and the Western race. The Western race, is the one that is native to Southern France, Northwest Italy and many islands in the western Mediterranean. The Hermann tortoise can grow to 15-18cm in length. The tortoises are brightly colored, with the Western Hermann tortoises having a yellow spot on their head behind each eye. The most distinguishing mark is the two dark bands that run along the length of the plastron, and this is something that the Eastern race does not have. The Eastern race, native to Southern Italy, Greece, Albania, Balkins and Yugoslavia, grow bigger in size to about 20cm, and their shells are not as doomed as the Western race. Most of the Eastern race do not have the yellow spot behind the eye, but the underbelly of the tortoise is more broken, and has faded marking heavier than the Western subspecies. The Hermann Tortoise are more active and like to climb, so it is important to keep them very secured where they are kept, with plenty of climbing room, and with plenty of sunlight shining through whether it is indoors or outdoors. The diet of the Hermann tortoise should consist of weeds, flowers, grass, hibiscus, wild lupine, endive, charlock, dandelion, romaine, watercress, chickweed, and plantain leaves. The tortoises can eat leaves of plants and bushes like ice plant, rose, lilac, and bramble. Greek tortoises are one of the five species of the Mediterranean tortoises, and are commonly seen and liked as pets that people purchase. The Greek tortoise is not large in size, but does need room to move around and exercise. It should be kept in an enclosure with a screened top, where it cannot escape easily. The Greek tortoise needs a warm environment, whether they are being kept on the inside, or the outside. The Greek tortoise can move fairly fast, and should never be left alone on the outside. The tortoise sleeps best on mulch, wood shavings, and other types of dirt mixtures, but should not be fed on the bedding. Greek tortoise diets should consist of endive, parsley, collard greens, dandelion greens, and some fruits in small amounts. Only apples, strawberries, and raspberries are recommended to give them, as long as it does not exceed more than 10% of their diet. Greek tortoises need water daily, and a container should be provide that is big enough for them to drink from. The Greek tortoises places of where they originated does cover a huge geographic area, preferably over three continents. These tortoises are still wild caught, so can harbor parasites and have some other types of stress and environment related problems. The Greek Tortoise are prone to dietary and respiratory illnesses, they are not a good candidate for being a beginner tortoise. 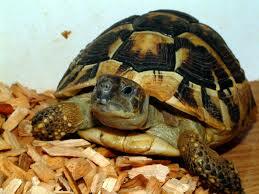 The Greek tortoises can be best kept by more advanced keepers that are more able meet their husbandry requirements. The Greek Tortoise has needs which vary, and are dependent upon the environment where the individual they originated. Generally very shy, the Greek Tortoises does quickly become outgoing after they get use to activities of their keeper. Most of them will continue on to look for many places to hide, and to bury themselves. A good type of indoor accommodation for small or medium Greek tortoises can be a larger plastic tub, a wooden cage, or other types of enclosure. Though glass terrariums are easy to find, and may be easier to use, they can restrict ventilation causing moist conditions that can be dangerous to this tortoises health. The tortoise can also benefit from being outdoors in soil and grass enclosed containers. The Marginated Tortoise, a very unique looking tortoise, fairly larger in size, and has flared marginal scutes from which it’s name derives. The males’ marginal scutes are known to be more flared than on the female. The Marginated tortoises can be very cold tolerant, and they should be kept and maintained where the temperature range is of 75 to 90 degrees Fahrenheit at the basking site. If temperatures fall 75 to 90 degrees, they will be inclined to hibernate. The Marginated tortoises are opportunistic feeders that eat things such as, dark leafy greens, weeds and some types of grasses. Marginated tortoises can consume insects such as snails and carrion if they get close enough to reach them. The tortoises are also capable of eating things like fibrous fruits such as apples and pears, along with various berries. Clean fresh water for them should be provided at all times in a water dish or bowl. The Marginated tortoise can become aggressive toward the femaleMarginated tortoise, and it may be necessary to enclose the two separately, with UV lighting that includes heat. People that purchase Marginated tortoises should consider a larger type of container for enclosure, that may include things such as logs, rocks, and plants. Outdoor enclosures need to include plants so that the tortoise can graze naturally, and to hide and retreat. Marginated tortoises need some kind of added interest when being enclosed, so placing certain other objects in the enclosure such as broken pots, and rockeries are important. A population of small and light-colored marginated tortoises do exist in the Southwestern part of Peloponnesus, which is between Kalamata and the south of Stoupa. The Marginated tortoise are related closely to the spur-thighed tortoise, being similar in how their body characteristics look. Both types of tortoises have large scales located on the front legs, larger scales on their thigh areas, moveable stomach plates, and they even both have a lack of spikes on their tails. The Egyptian Tortoise is one of the smallest tortoises there are, with the females being larger than the males. The Egyptian Tortoise is one that can live under arid conditions, more than conditions tolerated by any tortoise species in the world. People find these types of tortoises in rocky and sandy conditions, with the light coloration being an adaption to arid environments. The size of the Egyptian tortoise allows a fast thermoregulation for them, with the black pigmentation minimizing eat absorption from the sun’s rays. The Egyptian Tortoises are herbivores that feed on flowers and leaves of desert environments. The Egyptian tortoises are the most active during the warmer times during the year, and they are inactive when the weather is too cold, or too hot. The tortoises are known to mate in the spring, where the female tortoise can lay up to five eggs under a burrow, in shallow depression, or in sandy areas. Egyptian Tortoise is one of the world’s most endangered tortoises, and is extinct in Egypt. Human development in the Egyptian tortoise’s habitat can affect them in many ways. 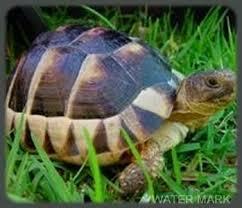 Egyptian tortoises are herbivores, that feed on types of rough grass, different types of fruits and plants. 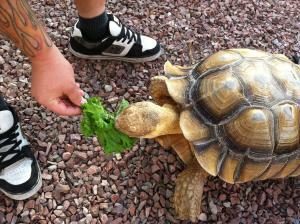 Most Egyptian tortoises should be fed chopped greens, such as endive, mustard, dandelions, kale, and other types. The tortoises range in different colors from an ivory color to a pale gold to dark brown and dull yellow. The Egyptian tortoise was once found in areas such as Egypt and Libya, their habitat in Egypt has been destroyed, which now make them extinct in that particular area. There are two populations of Egyptian tortoises that can still be found in Libya. The Egyptian tortoise appears to represent a lineage that has been diverged from the same ancestral stock southwards going into Northeastern Africa, around the same time as the marginated tortoise’s ancestors had diverged in the Greece area.